On Monday night after supper the five meditation groups met to discuss various aspects of religious life: community, prayer, work, human relationships, etc. One or two of the groups went to almost 11:00 pm in their discussions. The setting for the community meeting was the remodeled TV room which now serves as a conference hall and where we also watch our movies. A roll down screen with a ceiling mounted projector and air-conditioning were added. Christu Dehon Nivas is often chosen as a place for district conferences and ongoing formation programs. These are sometimes held in May or early June during vacation time — the hottest time of year in Andra Pradesh. A couple of years ago Fr. Stefan Tertünte, SCJ, from the Dehon Study Center in Rome was the presenter. He just about wilted away in the heat and that was the genesis of looking towards providing a place where meetings could be held without worrying about temperatures approaching 120 degrees. I’m sure that Fr. Charles Brown, SCJ, of the US Province will appreciate an air-conditioned conference room for his presentations when he comes next May to give a course on St. Paul to our brothers. Our rector, Fr. Michael Augustine, SCJ, serves as moderator of the community meeting. Each of the five meditation groups was asked to report on its discussions after which others could add comments not covered by the groups. Fr. Michael responded with comments and observations we (formation directors) had about the community since last we met. One example from last night: the brothers (students) rotate as homilist four days a week and at the end of Mass feedback is given by the community. More often than not it is the same few brothers willing to share their praise and suggestions to the homilist. The tweak that went into affect this morning: from now on the homilist is to pick three brothers before Mass to give their feedback. If this morning is any indication it should work much better than our old system. Fr. Michael also covered some topics where the brothers could improve, such as paying more attention to light housework duties after Mass and before breakfast. Little things –– yes –– but important to a well-run house. These meetings are not only about things that need improvement but also about praising the many things that went well between meetings by offering thanks or praise to different people for their contributions to the community. Along that line I think Br. Meghanandha (Mega) Chakravarthi Bandanadham, SCJ (3rd year) made a good point: “Often it is not only the brothers out in front that deserve our thanks and praise but the brothers behind the scenes that take their turns, such as with this year’s Feast of the Sacred Heart celebration and the on-going formation program on Founder’s Day.” Well said! Our usual breakfast routine was broken up this morning with a breakfast that would be well known to Americans: Rice Krispies and Muslix along with bananas and juice. I’ve never been able to find Rice Krispies in India though most other cereals are available so I brought with me a family size box for the students to try. Today is a free day for the students and it started with late rising and breakfast at 8:00 am. I had to rise earlier as I had the 7:00 am Mass for the Holy Family Brothers, picking up my routine from earlier this year of celebrating Mass for the brothers on weekends. One reason for making today a free day was all the activity of the past week in getting ready for and then hosting the district’s ongoing formation program. 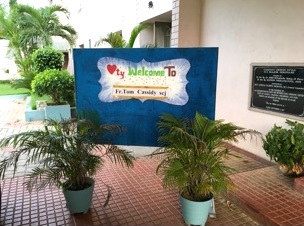 That ended at noon yesterday and then last night we all went to Sacred Heart parish Vempadu for the first Friday evening service that our students conducted. The service is done in a manner similar to a revival in the Pentecostal style — a lot of “Praise the Lord Hallelujahs” thrown in from time to time. There is, of course, a Catholic twist to it all. The service began at 7:30 pm with exposition of the Blessed Sacrament followed by a praise and worship service. I call it the warm up act. Last evening it was led by Br. Jesu Prasad Siddela, SCJ (thirdrd year). This portion of the service ran about 45 minutes and is designed to prepare the congregation for the sermon. Last evening it was delivered by Br. Chitti Babu Nandipamu, SCJ (second year) who spoke for 45 minutes. While this was going on Fr. Michael Augustine, SCJ, heard confessions underneath the bell tower. The service ended with benediction but very different from what Americans experience. In this service the priest goes around to each person and blesses him or her with the monstrance. When the Blessed Sacrament is returned to the tabernacle and the priest leaves the alter there is no closing hymn. The people simply get up and leave the church. We finished around 9:15 pm and went from the church to the parish house for supper before heading home. I don’t know all that well the history of the development of the Catholic Church in Andhra Pradesh but it certainly is the most Pentecostal compared to Goa or Kerala, two other areas of the country that I have spent time in. Kerala and Goa have a much bigger concentration of Catholics and that may have something to do with it. I have been told by our Andhra Pradesh brothers that the people have been heavily influenced by Protestantism where preaching is the central part of worship. Certainly in Goa and Kerala a homily of 15 minutes is the norm but here in Andhra it is generally 30 minutes or more. Birthdays are important events anywhere in the world and are certainly celebrated by our Indian SCJs. There is a house ritual to the experience. 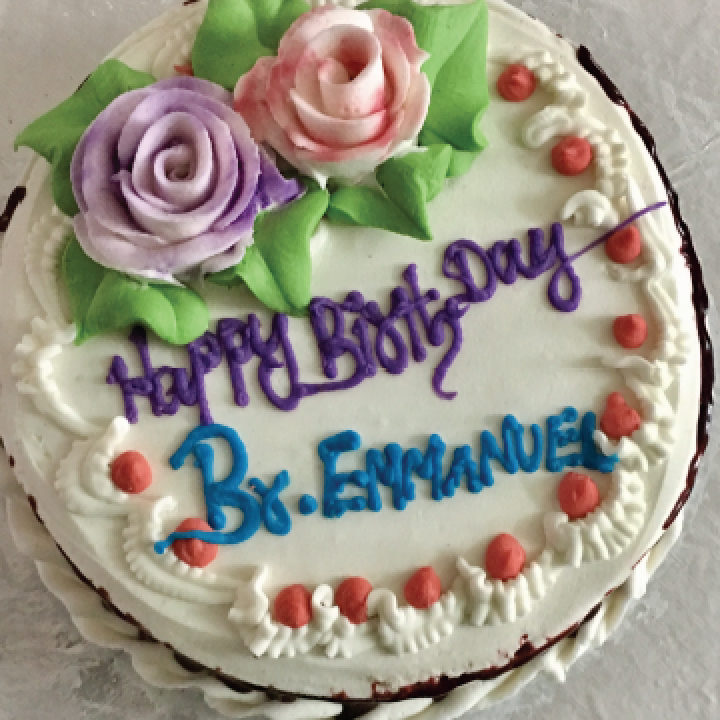 It starts with door decorations, prayers at Mass and morning prayer for the birthday honoree, and concludes with the presentation of a cake, flowers and hugs from all, along with the traditional birthday song. It kicks off with a few words from the rector (or in his absence, his delegate) on some of the positive qualities of the honoree in helping to build and live our SCJ community life. In the past, celebrations have included ice cream at supper provided by the honoree but that may have been suspended due to last November’s financial crisis or perhaps dropped all together, I’m not quite sure. Today we honored Br. Ravindra Uppuluri, SCJ (3rd year) who celebrates his 26th birthday. He comes from a nearby village no more than an hour from here. I first met Ravindra when he was a novice in Nambur and at that time I knew him as “Emmanuel.” Soon after I got here he told me he preferred to be called “Ravindra.” Much to my surprise this morning the cake had his old name, a name I have not heard for almost three years. Part of the birthday ritual is for the superior (or his delegate – me, in this case) to cut a small piece of cake and feed it the birthday honoree and for him to feed the superior, much like at a wedding in the United States. Unfortunately, the cake was kept in the freezer and was as hard as a rock. Ravindra and I managed to cut small pieces and carry out the ritual as prescribed. We then sent the cake back to the kitchen to thaw and will enjoy it with lunch. Normally the cake would be sliced and served at breakfast. Br. Franklin Victor, SCJ (3rd year), one of Ravindra’s classmates, confessed that the frozen cake was his doing, something got lost in translation. The instructions were to put the cake on top of the refrigerator but he took it to mean to put it in the freezer compartment at the top of the refrigerator. No harm done, just a delayed treat. Yesterday our entire community, save two brothers not feeling well, traveled to Br. Sekhar Adam Nandudri’s village of Lingapuram for his mother’s funeral. It was scheduled for 3:00 pm but as we arrived late, and I’m sure a few others as well, including the assistant parish priest, the funeral did not begin until about 4:00 pm. Our trip was dictated by the theologate schedule. Our brothers were excused from the last hour but by the time they all biked home and we had our lunch it was closer to 1:00 pm before we got underway. We managed to fit everyone into our van, truck and two motorcycles (one of ours and the other belonging to Fr. Jojappa Chinthapalli, pastor of Sacred Heart parish, Vempadu, who took on one of our brothers for the three-hour journey. 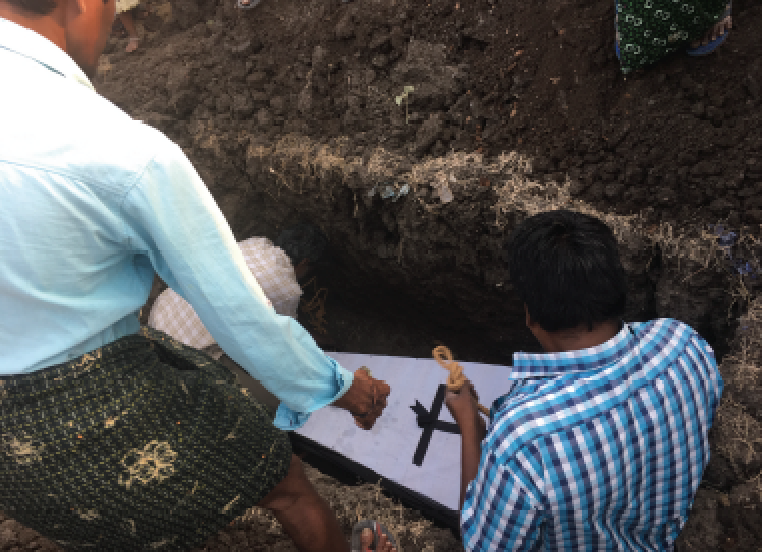 Funeral and burial customs vary around the world, and I’m sure even in India itself. Here in Andra Pradesh things are simple. The mother’s took place around 6:30 in the morning and by late afternoon her coffin would rest in the earth. Between her death and the funeral Mass she was prepared for burial and while I’m not sure by whom I would suspect women relatives did so, perhaps assisted by women of the village. As India is a hot country a refrigerated glass casket is used to place the body in for what back home we would call a wake. This is placed just outside the house as houses are very small and could not accommodate the crowd. When the assistant parish priest arrived we had a short prayer service and the placing of her body into a simple wooden casket covered with white cloth and black trimming. A garland of flowers was around her neck much like we place rosaries in the hands of our deceased Catholics in the States. Most of the priests went to the church before the procession from the house to what really is called a sub-station chapel. It did not take long to hear them coming. Led by our two brother servers and accompanied by the beating of drums and the setting off of firecrackers the mourners moved slowly from the house to the chapel. The use of drums and fireworks seem to accompany almost any type of procession. The Mass was what we would be used to in the States with a few minor differences. An introduction to the Mass is a regular feature of an Indian Mass. As Fr. Jojappa is our best Telugu speaker he gave it. The main celebrant of the Mass was our formation house rector, Fr. Michael Augustine. One surprising element was the lack of a homily. I was told that the people begin to relax once the body is in the ground. In seven days there will be a memorial Mass at which time more family members and friends who could not make it to the funeral (as it was on the day of death and therefore very short notice) will be in attendance. The family will also be in a different stage of grieving then. I’m reminded what a good friend of mine Leo Graham, a psychologist, often said: Death is always a surprise. Adam’s mother’s death is a case in point. She had been bed ridden for over seven years and had been in declining health in recent months. Adam went home the day before her death and still it came as a surprise when she took her last breath around 6:30 am yesterday morning. Adam told me he was up with his mother all night and around 5:30 am fell asleep himself, he woke just before she breathed her last. Adam has several brothers and sisters including one brother who basically has been taking care of his mother since an accident crippled her. The procession to the cemetery did not take long. I was a bit surprised (though probably should not have been) that traffic did not stop nor for that matter slow down as we walked down the highway with drums beating and fireworks going off in front of the procession and honking horns from in back as drivers impatient to be on their way whizzed by. The burial service was conducted by Fr. Jojappa. At its conclusion but before the casket was closed for the last time Fr. Michael placed a second garland of flowers in the casket, and with the lid nailed shut several men lowered her into the ground. All present took a clump of dirt and threw it into the grave. Completely covering the grave would be left to others as the mourners left to take part in a simple meal. Two interesting customs not found in the States caught my attention. Except for immediate family no women come to the cemetery. Consequently the crowd of mourners were men and young boys. There is, by the way, no attempt to shield the reality of death from the young. Second, upon arriving back at the house buckets of water were placed so the mourners could wash their legs and feet. This custom, as explained to me, is a precaution against any disease that might be present in the cemetery. The meal was served as usual with the priests and religious sitting at a long table and men dishing out the rice and side dishes. There was not enough room for all at the table so many of the brothers sat wherever they could find a comfortable spot. Eating with hands and holding a plate is actually rather easy to do. With the meal ended we said our goodbyes. Saturday was a day of mixing ancient and modern traditions. For me it began with Mass at the Holy Family Brothers’ minor seminary just down the road from us. I usually say Mass on Saturdays and Sundays since I now have an international drivers license and can drive myself to and from. It was good to get back as I enjoy the enthusiasm and fine singing of the young men, probably ranging in age from early to late teens. Following Mass and breakfast (my usual Indian breakfast of bread and peanut butter) I headed out for my walk. Getting it in early was a necessity given the plans for the rest of the day. The community was preparing to celebrate the Tamil Nadu Pongal festival. [Pongal is a festival of thanksgiving] I believe it’s the first time our Christu Dehon Nivas community in Eluru is celebrating it. Fr. Michael Augustine, SCJ, our rector, was born and raised near Chennai in the heart of Tamil Nadu (the state). 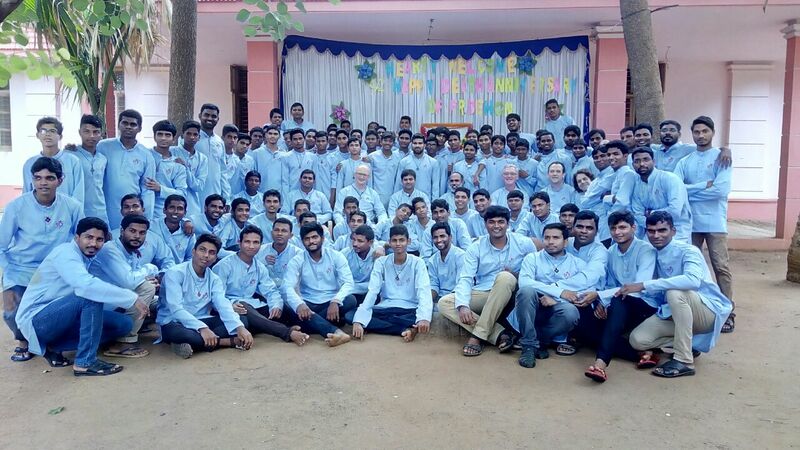 I’m not entirely sure we would have gone to the effort if it were not for the sisters’ postulant community next to our Nambur novitiate as both Sister James and Sister Augustine (the house superior) and their postulants come from Tamil Nadu and did much of the necessary work that goes into this harvest festival. 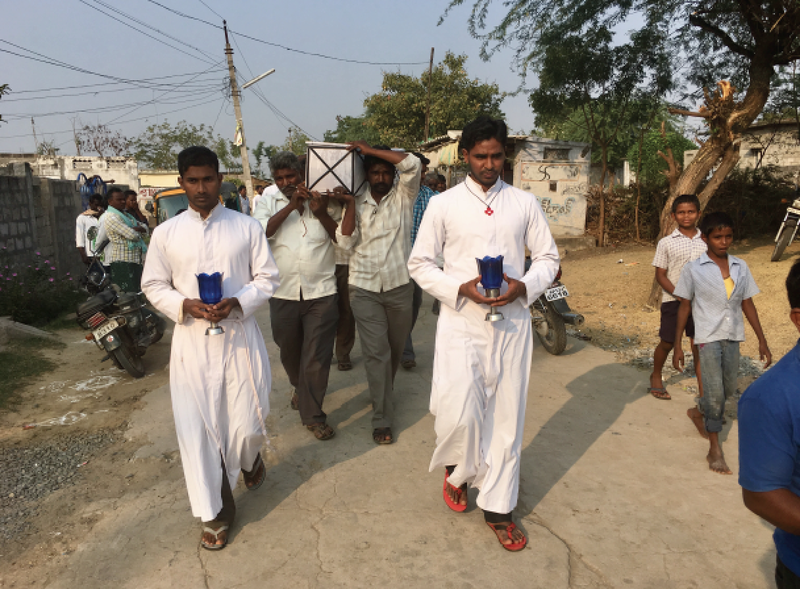 While the feast comes out of the Hindu tradition, Christians have made adaptations to it. 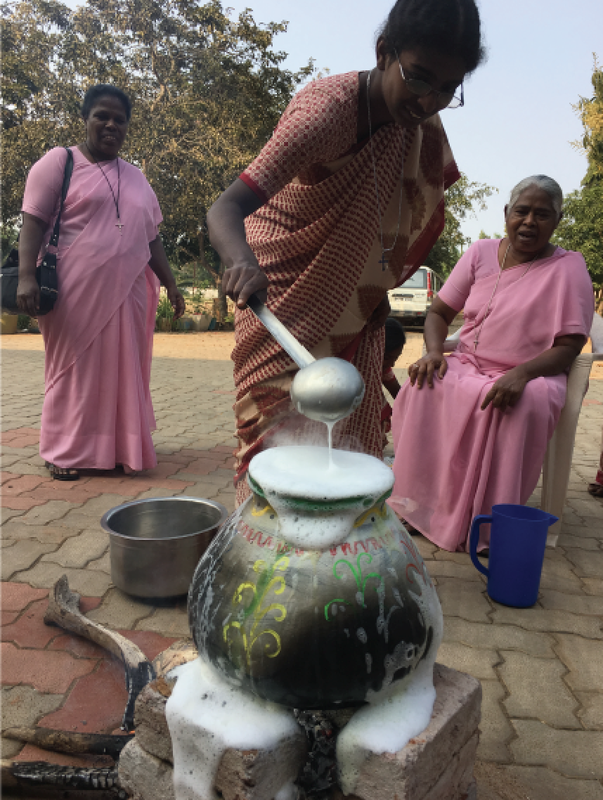 Our local Pongal celebration began just a tad late as the sisters took the opportunity to visit the Holy Land, a local representation of the important religious sites and events in the life of Christ, run somewhat like an amusement park or museum. Our own Fr. Joseph Kasmir, SCJ (assistant novice master and treasurer of our Nambur community) served as their driver and took part in our house celebration. Usually Catholic celebrations begin with Mass but the most important event of Pongal is the cooking the Pongal (a rice dish). A special pot just for the occasion is prepared and decorated; our own Br. Mary Babu Kota, SCJ (3rd year) decorated our pot with floral designs. As the Pongal cooks to perfection participants do a dance around the Pongal pot and when all is ready our Pongal pot was led in procession as the community processed into our temporary chapel. The Mass was celebrated in Tamil with Fr. Michael as our principal celebrant. It followed the Indian Rite. Fr. Michael is the only Tamil-speaking priest in our local community but he was able to get some of the concelebrants to dip their tongue into Tamil during the division of parts that take place in the Eucharistic Prayer. The introduction to the Mass was prepared by Br. Shaba Dennis, SCJ (3rd year) who also speaks Tamil while the homily was shared by the postulants of the Sisters of Aloysius Gonzaga. They prepared (in English) a brief history of the Pongal feast while Fr. Michael added how it has been adapted by Christians. A good example is that that Sun God is seen as Jesus the Light of the world and just as the sun is necessary for human existence so Christ is to the salvation of the human family. Upon the conclusion of Mass it was time to eat our Pongal and begin our cultural program. 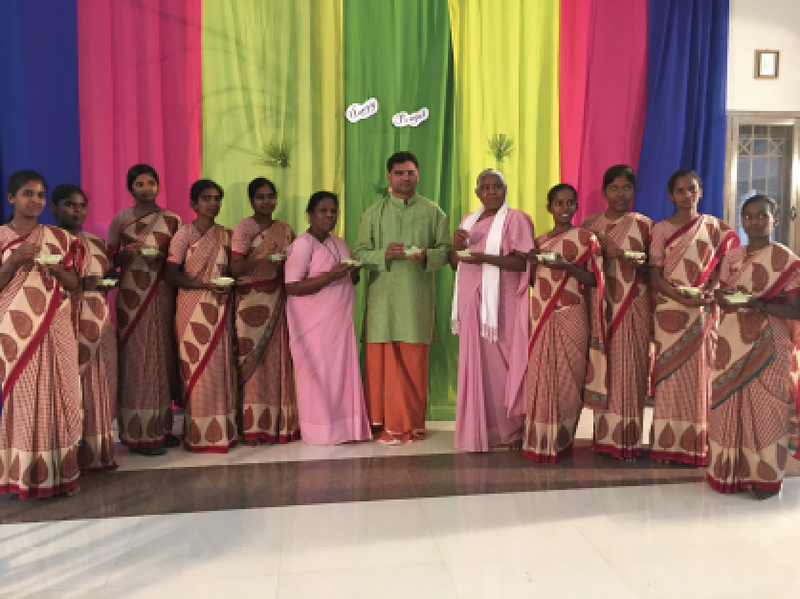 It was a departure from our usual performances as we not only had dances and skits by our Christu Dehon Nivas brothers but also by the Franciscan Sisters of Aloysius Gonzaga postulants. Fr. Tom Cassidy writes about doing a house blessing for the mother of one of the SCJ students in India. Benefactors from the US Province funded the construction. I recently took part in a house blessing for the widowed mother of Br. 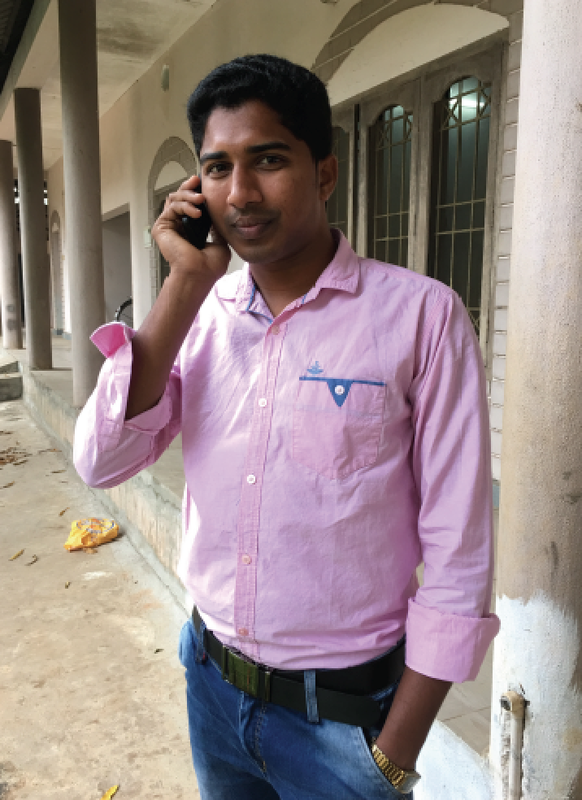 Thambi Joseph, a third-year SCJ theologian. Funding for the house was through the US Province; Pam Milczarski of the Province Development Office was instrumental in connecting donors to the project. Br. 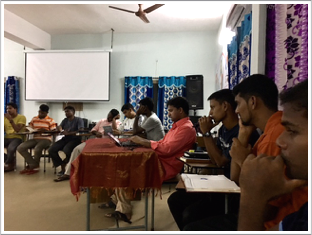 Thambi, along with nine fellow students and other SCJs, traveled three hours to be present at the blessing. Br. Thambi’s mother, Fr. Suresh, Fr. Michael Augustine and Fr. Tom cutting the ribbon for the new house. The celebration was done in a mix of English and Telugu. Br. Thambi is fluent in English, but his mother is not. Br. Harish (Hari) Kumar Barigala (4th year) translated my brief remarks as well as read the Telugu version of the blessing ritual. 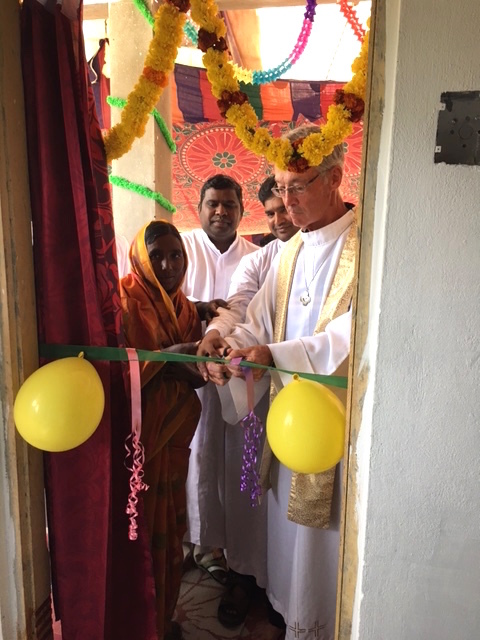 After the ribbon cutting, and sprinkling each of the rooms with holy water, we celebrated Mass. Our SCJ students provided the music and various ministerial parts. Fr. Michael Augustine was the celebrant and Fr. 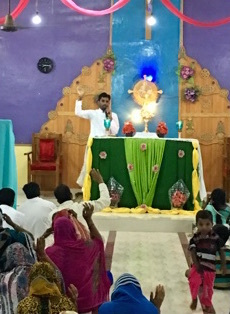 Suresh Gottom, assistant priest at Sacred Heart Parish, Vempadu, preached. The Mass was in Telugu. As is the custom just before the final blessing, Br. Thambi thanked everyone involved in making the day a memorable one. He also, through me, offered his thanks to the US Province, Pam, and those benefactors who contributed the funds needed to construct his mother’s new home. The family moves from what I’d call a hut with palm leaf roof into a house that can withstand monsoon rains and provide a safer and more secure environment for her and Br. Thambi’s two younger brothers. It is a small house with two bedrooms, a small kitchen and a living/dinging area. While I don’t have the exact figures with me, a house like this typically costs around $5,000. As is tradition, a meal followed the event. We ate in what is the living/dining area the new house. The meal begins with washing of your right hand, the one used for eating, as well as some water to rinse off your paper plate. Glasses of water are filled and then the food comes. Today we had fried rice and white rice along with beef, chicken and fish dishes topped off with curd and bananas.